Years after graduation they are still roaming the street of Tunis, Abuja, Johannesburg, Casablanca, Nairobi and other African countries. Unable to find employment some join criminal gangs, others opted for menial jobs and street vending while some resort to hand their fate to God. 26 year old Mohamed Bouazizi was one of them, a college graduate in Tunisia who was unable to find job years after graduation opted to selling vegetables on the street in Sidi Bouzid to support himself and his family. On Dec 17th, 2010 when police shut down the vendor chart of Mohamed (apparently because he has no vendor permit) they never knew they are about to start a revolution that will topple President Zine El Abidine Ben Ali. As a good citizen Mohammed took his case to the municipality all to no avail. With his source of family income gone, all avenues to reclaim his business closed, Mohamed left a message for his mum on facebook to forgive him, took a can of gasoline went in front of the local government and set himself on fire. The next day December 18th, 2010 the Jasmine Revolution (nickname for Tunisia revolution) started, Mohamed gave up the ghost from his wounds on January 4th, 2011 and on January 14th President Ben Ali government was toppled and the dictator fled the country to Saudi Arabia. It is noteworthy to mention that President Ali initially wanted to land in France but was rejected before he now fled to Jeddah Saudi Arabia. With the collapse of President Ali government as a result of the Jasmine Revolution, Africa was on the news again. Just last week Southern Sudan started a vote to determine if they will remain part of Sudan or secede. President Laurent Gbagbo still refused to cede power to Ouattara that was declared winner of the presidential election. History recorded that on January 14, 2011 Tunisians refused to be a sit –at- home activists, and for the hottest places in hell to be reserved for them for maintaining neutrality in times of great moral crises thereby became the first Arab country to topple its government through a popular uprising. So what led to the fall of dictator President Zine El Abidine Ben Ali? First a brief history on how President Ali came to power. Tunisia a Muslim populated country practices republican presidential system of government with the President as Chief of state and Prime Minister as the head of government. Tunisia has a bicarmel legislature with their court system inclined toward the French civil law. President Ali was the second president of the republic of Tunisia. He was first appointed Prime Minister on October 1987 and then assumed the office of the president on November 7, 1987 after a bloodless coup d’etat that removed president Habib Bourguiba from power accused of being incompetent. Since Ali’s assumption of office he has always been re-elected with majority in every election. It must be noted that President Ali came to power when Tunisia was on the brink of economic collapse and radical religious extremists was pushing to take over power. But his economic reforms improved Tunisia, the country Gross Domestic Product (GDP) which was $1201 when he took power rose to $3,876 in 2008, and the GDP averaged 5% growth annually since 1986 apart from 2002 when drought and drop in tourism stalled the growth to 1.9%. There was no surprise in July 2010 when Tunisia was listed with Algeria, Egypt, Libya, Mauritius,Morocco,Botswana and South Africa as “the African “Lions” in a report by Boston Consulting Group (“The African Challengers: Global Competitors Emerge from the Overlooked Continent”) . The country was also ranked first in Africa and 32nd in the world by the Davos World Economic Forum in their 2010-2011 Global Competitiveness Report. Trade with European Union, tourism and agricultural production all contributed to the stability in the growth of the GDP. President Ali government established the National Solidarity fund which was to be used as a wheel to fight religious extremism and terrorism through economic empowerment of the citizens, development and rule of law. It is noteworthy to mention that like the economic policies of President Obasanjo during his 8years reign as the president of Nigeria, majority of Tunisians living in urban and rural area never reap the fruit of President Ali economic reforms. High unemployment remains stubbornly high among the youths of Tunisia, small business owners were also left out in the economic boom. Also under President Ali Tunisia freedom of speech was brutally suppressed and journalists like Taoufik Ben Brik were harassed and hounded to prison for daring to criticize the dictatorial rule of President Ali. Tunisia already on edge as a result of high unemployment, rising food prices, suppression of human rights and brutalization of oppositions was triggered into revolt (starting from a relatively unknown Sidi Bouzid ) as a result of Mohamed action and wiki leaks as a catalyst. 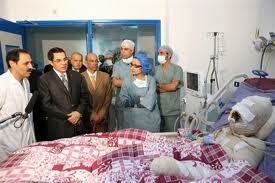 The Jasmine revolution became energized on January 4th, 2011 when Mohamed succumbed to his wounds. Initially the presidents try to quell the revolt calling them “masked gangs” and on January 13, 2011, he announced he would not run for another term in 2014 ”I repeat now, no presidencies for life” and pledged steps to improve the economy and press freedom. However Tunisians defied him and the next day January 14, 2011 more citizen troop to the streets, the president declared a state of emergency dissolved the government and promised election within 6 months but still the riot persisted. With the President not able to withstand the heat, he fled the country on January 14, 2011. The pro western Prime Minister Mohamed Ghannouchi initially took over the reign of power but, Fethi Abdennadher the head of Tunisia constitutional court ruled that Ghannouchi was not constitutionally the next line in power to succeed President Ali but Fouad Mebazaa the parliamentary speaker. Mebazaa is now the president with a mandate to organize election within 60 days. The Jasmine revolution is no surprise; political consciousness is waking up in developing countries thanks to poverty and underdevelopment. The people who have been there all saw it coming; Nelson Mandela, “There is no easy walk to freedom anywhere, and many of us will have to pass through the valley of the shadow of death again and again before we reach the mountaintop of our desires”. Martin Luther, “Change does not roll in on the wheels of inevitability, but comes through continuous struggle. And so we must straighten our backs and work for our freedom. A man can’t ride you unless your back is bent.” Thomas Jefferson,” The tree of liberty must be refreshed from time to time with the blood of patriots and tyrants”. It all shows that there is always a price to pay for freedom. History right from the biblical Pharaoh “let my people go” have shown that freedom is earned and not given. If you want good government you have to demand for it, unfortunately it comes at the cost of blood of innocents. Bonar Law is not wrong when he said that “there is no such thing as inevitable war. If war comes it will be from failure of human wisdom.” For indeed President Ali brought the calamity that fell on his government. The Jasmine revolution also brought to fore where the interest of the western countries lies. All through the Tunisian revolution from December 18th, 2010, the international media gave it lack luster coverage when compared with the 2009 Iranian uprising. In the Iranian uprising the US government went as far as asking the social media Twitter to suspend their scheduled upgrades in order to enable Iranians share the uprisings. We understood the western countries fear of anti- western government occupying the presidential seat in Tunis since President Ali is pro western; however it is only good government that will take developing countries away from the jaws of poverty and underdevelopment. Western countries MUST encourage anything that will enthrone good governance in developing world, aids and World Bank “shylock” loans will never get developing countries to be in the league of developed countries. Billions of dollars looted from this developed countries especially Africa are sitting in some bank accounts in Swiss while the developing country yearns for development. The best tool to fight extremism is economic empowerment, for as long as majority of Arabs and Africans remain poor they will always find solace in religious extremism and civil wars respectively. President Ali defended women’s right, kept religious extremist out of power and created educated middle class (when compared to other African countries), a positive assessment by Western apologists but not so with Tunisians when majority of them are still poor and food prices rising. It goes to say that government policy ought to be for the interest of the masses. No matter how good a government policy, it is of no use if it fails to impact the masses. President Mugabe started the process of land redistribution but instead of re-distributing the land to the poor masses of Zimbabwe, his cronies acquired the land thereby negating the essence of the land reform. President Ali economic reform failed to provide for the rural and urban masses of Tunisia. The president repressive regime made him an enemy of the middle class though they continue to support him until the recession hit and ruined Tunisia export dependent business. President’s Ali ouster is also a lesson for rulers that surround themselves with sycophants and refuse to listen to their people. Unfortunately it was too late for the president to realize he is “duped by his entourage” that even firing his aides and apologizing for not listening to his people could not douse the revolution. The president failed to listen to the voice of wisdom when he and his “accidental billionaires” cronies (now checked into choice hotels in France as result of the revolution) were busy rigging elections and silencing the position. There is always a limit on how long you will take people for a ride. The day of reckoning for dictators will surely come, Mubarak and co dictators you still have time to make a change. The internet and social media is also playing a vital role in the political awakening of Africa and other developing countries. The problem is that only a few have access to internet in these developing countries (5.6% of population in Africa, 10.4% in Latin America/Caribbean and 42.0% in Asia according to Internet World Statistics). But still it is an indispensable tool that will usher in a new era in developing countries. Though majority is of the opinion that the social media did not play a vital role in the Jasmine Revolution compared with the 2009 Iranian revolution but discussions are continuously going on bad governance and corruption. Awareness is growing and people are getting to know they can use their vote to make change in their life and for generation unborn. 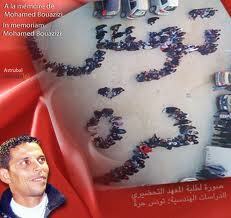 Mohamed Bouazizi will forever live in our mind. History has accorded him a place and change is coming in Tunisia. Election will hold in 60 days and it’s time for Tunisians to use their vote and make a change. The death of Mohamed and other innocent Tunisians that died in Jasmine revolution will never be in vain. Tunisians must show that this brave men and women died for nothing. Their souls can only rest if a new government that will address all the issues that caused Jasmine revolution is installed. Jasmine revolution is a lesson and warning for all developing countries with authoritarian and dictatorial rulers. It is a matter of time before the chicken comes home to roost. An excellent article, and worthy of the Shaheed who have fallen. We pray and hope for the people of Tunisia, who have begun this monumental Jihad to rid themselves and the Muslim world of tyranny. As we have all seen with our own eyes, it takes just one individual to stand, and the rest will follow – if only this could happen across the Muslim world and we could then be free to follow Islam in its entirety.